Bike Santa Cruz County is excited to announce our latest project, a temporary protected bike lane in Live Oak. This three-month demonstration project on 17th Avenue, from Brommer Street to Felt Street, will connect the Brommer St. route to the Boys and Girls Club, Simpkins Swim Center, Twin Lakes State Park, and Shoreline Middle School. In order to accomodate a five-foot bike lane with a two-foot buffer and physical barrier, the center turn lane will be blacked-out and narrowed when re-striped. Reducing the lanes will not only provide space to add a buffer to the bike lane, but it will also slow the speed of traffic. The goal of the project is to present a new type of roadway feature and collect feedback from the community, this is referred to as Tactical Urbanism. We anticipate a positive response and hope to see this model used for other roadway improvements across the county. The pop-up will be installed in late Summer and will complete in the Fall. Protected bike lanes include a physical barrier such as raised medians, on-street parking, or bollards between the bike lane and the vehicle lane. By imposing a separation between cyclists and automobile drivers, cars are deterred from drifting or swerving into the bike lane and striking a bicyclist. Around the world, studies have shown that protected bike lanes have exponentially increased safety when compared with painted lanes only, due to the physical separation between cyclists and motorists. Protected bike lanes have the added benefit of increasing bike ridership significantly. After a protected bike lane was installed on Chicago’s Kinzie Street, bicycle ridership increased 55 percent, according to morning rush hour counts and 41 percent of respondents changed their usual route to take advantage of the new lane. (SOURCE: Chicago DOT, 2011–Initial Findings: Kinzie Street Protected Bike Lane). Compared to counties of similar size, Santa Cruz County ranks among the worst for collisions between cars and bicycles that result in injuries and fatalities to bicyclists; injuries and fatalities to pedestrians under the age of 15; and hit and run collisions involving automobiles. By installing protected bike lanes on our highest capacity roads, we have the opportunity to significantly increase cyclist safety. Unfortunately, protected bike lanes can also pose political challenges because they often require the removal of on-street parking spaces. 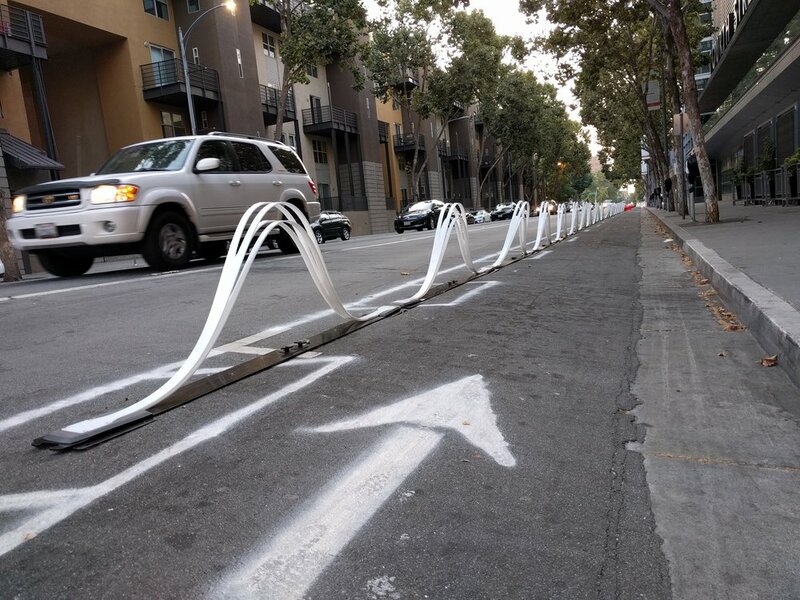 Recognizing the possibility of opposition to protected bike lanes, the temporary demonstration lane is designed to invite community input regarding the desirability of a permanent installation, as well as for improving the facility if it were to become permanent. The pilot project also helps to educate the community and garner support for change. Proposed design of the Pop-up Protected Bike Lane on 17th Avenue in Live Oak, Santa Cruz County. Bike Santa Cruz County is currently raising $30,000 to cover the cost of materials, promotion and outreach, and staff time for this project. Materials include black, yellow, and white traffic tape, wave delineators, tempera paint, and industrial velcro. Promotion and outreach will include neighbor notices, door hangers, advertisements in local publications, and flyers. Data collection will include paper surveys as well as online surveys distributed to residents, businesses, parents and students of Shoreline Middle School and Del Mar Elementary, and Boys and Girls Club, as well as Simpkins Swim Center. We will also need numerous volunteers for the promotion and installation/takedown of the demonstration project. The project will require door-to-door contact with residents and businesses along the route as well as an all-day installation and all-day takedown of the demonstration. If you would like to volunteer, please email volunteer@bikesantacruzcounty.org. For more information about the project, email Janneke Strause at director@bikesantacruzcounty.org.